Tension between the left-led government and New Democracy over the police's response to violence at Sunday's demonstration against the Prespes name deal in Athens escalated on Monday after the conservative opposition published photographs showing protesters with their faces hidden by hoods, helmets and masks walking among the demonstrators carrying iron bars and bats without drawing the police's attention, just moments before rioting broke out. “ND has always condemned violence from whatever quarter it comes,” the party's office said in an announcement late on Monday, responding to accusations from the government that the conservative opposition failed to denounce the right-wing extremists who caused Sunday's clashes. 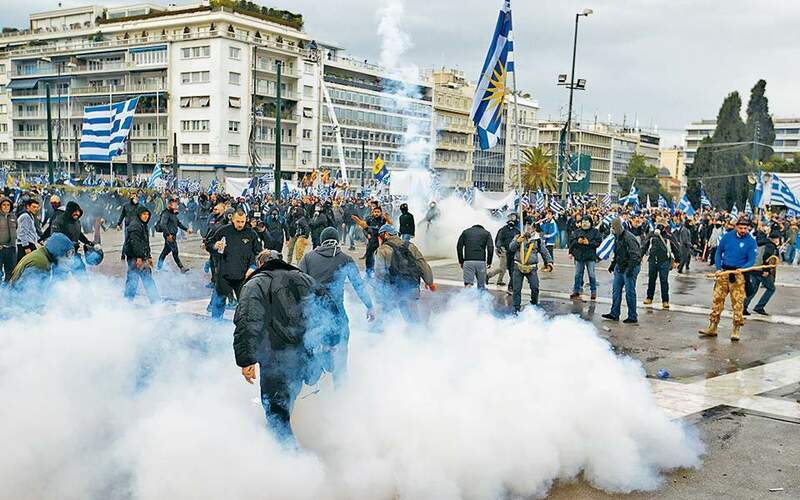 The leadership of the Greek Police (ELAS) has come under fire in the wake of Sunday's clashes for the excessive use of tear gas and stun grenades by riot officers, which resulted in several bystanders having to be hospitalized with respiratory problems. More than 25 police officers were also injured in the clashes, which saw a few dozen protesters assault riot squads with rocks, sticks, crow bars, fists, Molotov cocktails and other projectiles. “The police did what it had to do to maintain order,” the government said on Monday, defending ELAS. “Instead of accusing those who purportedly failed to condemn the riot caused by the usual bullies, the government and Mr [Prime Minister Alexis] Tsipras himself should provide immediate answers to the questions of citizens who suffered an unprovoked and unacceptable attack with chemicals by police,” New Democracy said in its statement. ND also called for an inquiry into why the rioters were allowed to reach the steps of Parliament and why more arrests were not made given that some 2,000 police officers had been assigned to the rally.